Back In The Day, when I was trying to explain what I meant when I was talking about social software, but before Coates pulled my fat out of the fire by doing the work for me, I had all these wicked abstruse definitions that made everyone’s eyes glaze over. The only definition I ever found that created the lighbulb moment I was feeling was “Social software is stuff that gets spammed.” Not a perfect definition, but servicable in its way. 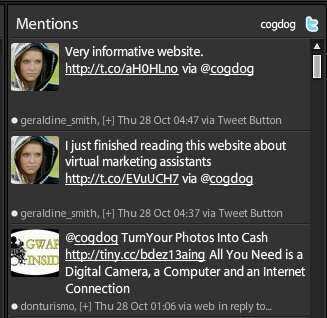 Today was twitter spam day for me- I blocked the turd makers already via tweetdeck, but two were from someone claiming by photo to be a sheepish gal with links to online money making sites attributed “via @cogdog” and another was some get money for cameras @ed to me. This is just the first rising of the spam waters, stand back, as I am surprised it is taking the spammers so long to drop their turds in the twitter waters. Get ready to each day having to stop your checking what your friends had for lunch to delete and block spamtwits. 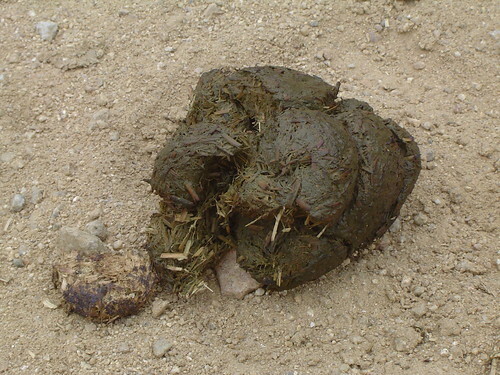 Until now, twitter was just some happy hippy loving play ground, but from today on, you will have to be watching where you step and ducking the pigeon diarrhea falling from above. Twitter hits the big time, at last. Shoot, Sir Dog, I hate this. Maybe it is because I am an academic, but I always do the citation chaining when someone shares a link as a via or a RT. I want to see the original source, in part, because I might discover other thinking/linking goodness in that original twitter stream. I want to see and provide a citation trail myself brother Alan, but I don’t want tone fake inserted into one like this. There’s little technical reason why twitter cannot store thus info as data wrapped around a tweet rather than make it something hand typedin the content. What we haven is the equivalent of asking web page designer to hand type in HTTP header data into the contents of a web page– it’s not only dumb and sloppy, it us sloppy and dumb. It’s time for twitter to become a more robust data channel. Horrortaxi has a real way with light and composition.